There is a statue of the dancing Shiva in Geneva, known as Nataraj and symbolises as the cosmic ecstatic dancer and a Hanuman statue at Bali. Most famous statues outside India also found in the Hindu temples of Prambanan Temple in Java,Shiva Hindu Temple in Amsterdam and Madhya Kailash Temple in South Africa. Indonesia is building a new landmark for Bali, a very giant statue of Lord Vishnu mounted over Garuda in Garuda Wisnu Kencana Cultural Park. The Garuda Wisnu Kencana statue and monument will be the tallest statue of Indonesia. The island of Bali in Indonesia also has Statue of Garuda, Statue of Lord Hanuman and a 75.5 ft statue of lord Vishnu in the Lotus Pond area of cultural park. 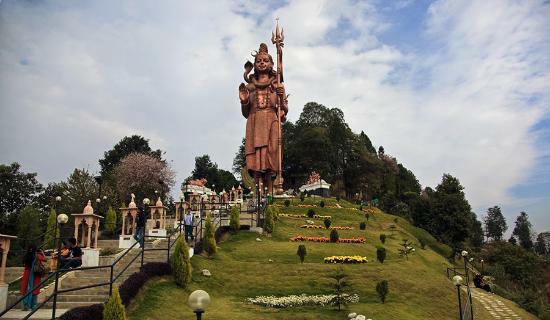 Kailashnath Mahadev Statue in Sanga of Nepal is the tallest statue of Lord Shiva in the world and indeed a marvel of Nepalese engineering. The statue has become a prime tourist attractions for Indians and a source of religious tourism in Nepal. 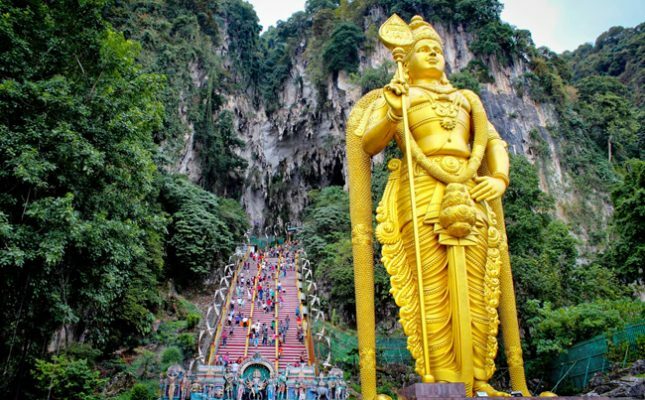 Lord Murugan Statue at the foot of Batu Caves in Malaysia is one of the tallest statue of a Hindu deity in the world and also the tallest statue in Malaysia. Mangal Mahadev Shiva Statue at the entrance of Ganga Talao in Mauritius is the same as statue of Lord Shiva in Sursagar lake in Vadodara. The Sagar Shiv Mandir on the bank of Ganga Talao is dedicated to Lord Shiva and also house temples of Lord Hanuman, Goddess Ganga and Lord Ganesh. Ganga Talao of Mauritius has tallest statue of Durga Mata in the world, the 108 ft tall Durga Mata Murti is one of the prime tourist attractions for Indian Travellers. Trinidad and Tobago is home to a magnificent statue of Lord Hanuman in Carapichaima. Dattatreya Temple complex is the famous religious sites in Trinidad and house Karya Siddhi Hanuman Temple and Statue. Chatsworth is home to the largest Lord Hanuman statue in South Africa. Ardhanarishvara statue in Johannesburg is the half Shiva and half Parvati statue, also known as Shiva Shakti statue is the highest Shiva Shakti statue in the world.